Finding the right commercial electrician for your Dulwich business should be a breeze – go to the internet, search for ‘commercial electricians in Dulwich’ or ‘three phase electricians Dulwich’ etc. and click on the first link. Give them a call. Job done. You may get lucky and find the best electricians in your area but just as likely, you could land yourself with a headache. Anyone can say anything ‘on paper’ – they can install three-phase switchgear; they can fit the most appropriate energy saving lighting for your office; they will supply and install kitchen equipment in your hotel in Dulwich … Over the 25 years that we have covered the south London area, including Dulwich, we have found ourselves called out to sort out a mess because the commercial electricians who were hired were not up to the job. Take for example the ‘MyHotel‘ chain. OK, granted the job wasn’t in Dulwich but it still serves as a warning that you need to be a bit careful. The hotel manager had called in local commercial electricians when the power went out in the hotel. They were having a problem with a water leak that got into their mains panel which was an 800 amp main switch fed by 630mm SWA cables. Apart from the inconvenience of an interruption to their supply, it also posed a significant danger to the hotel guests and staff. When we got there, we discovered that we were no less than the third electrical emergency service he had called to try to get their power back up and running. The other two had failed as the job was far too big for them to cope with. They were used to working only with low rated supplies. But with our experience of working with major hotel and retail chains, for us, the job was all in a day’s work. We have call outs every month to work on supplies of as high as 2500 amp three phase installations so we soon had the mains panel sorted out and another central London hotel was back up and running and safe for staff and guests. The problem was that the manager knew nothing about electrics and the other emergency electricians used a receptionist to book in jobs. Neither receptionist asked about the supply, had they done so, the electricians would have known that they would have been out of their depth before arriving, saving a lot of time and hassle. When you call South London electricians about an electrical fault at your Dulwich business, you get to speak with a fully qualified and experienced electrician. He will ask you the right questions about the job and will arrive on time, with the right knowledge and equipment to quickly solve your electrical issue. Commercial electrics require specialist knowledge, training and many years of experience as they are a lot more complex than domestic electrics. For safety’s sake if nothing else, you need to ensure that the commercial electricians you hire are qualified and experienced in carrying out repairs and upgrades to the sort of systems found in offices, garages, industrial units, factories and warehouses. 1. Check they are on Trustmark, TrustMark members are technically competent, carry out business ethically, delivering a fair job at a fair price with no hidden costs. 2. Check that the electricians will insure their work, giving you the peace of mind that your job will be completed conscientiously and if anything should go wrong following completion, they are responsible for putting it right. 3. Chat with other business owners and managers that you know, find out who they use and trust. 4. Describe the nature of your job and ask them to come to make an estimate in person. During the estimate, you will get a better feel of their ability to do the job. Be prepared for a good commercial electrician to ask you some technical questions either before or during the visit. A reputable and experienced electrician will be able to give an estimate or even a firm price on the spot. 5. Find as many customer testimonials for the electricians as you can, for example on Checkatrade. 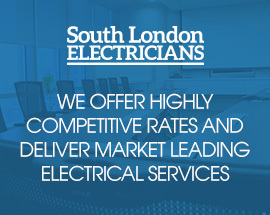 South London Electricians are THE commercial electricians of choice for Dulwich. We install energy efficient lighting for offices, retail units, car parks, light industrial units, warehouses, cold stores and factories; change fuseboards; install high current three-phase electrical machinery including catering equipment; carry out partial and full rewiring of commercial premises; install switchgear, back-up generators and armoured cabling plus flameproof wiring for paint spray booths, MoT bays and more. So give us a call on 0208 406 9834 without any commitment whatsoever – you will speak directly to an electrician (not a receptionist) who will offer you the best advice based on your electrical requirements there and then.